A Nobel prize for an ignoble deal? MOMENTS AFTER it was announced that the United States and its allies had reached a nuclear deal with Iran, the drums began beating for a Nobel Peace Prize. Carl Bildt, the former Swedish prime minister, tweeted happily: "I think the work of the Nobel Committee ... this year just got much easier." On Wednesday, a director of the Stockholm International Peace Research Institute, an influential think tank with ties to the Nobel organization, recommended that the 2016 prize be awarded to Secretary of State John Kerry and Iranian Foreign Minister Mohammad Javad Zarif. As soon as the Iran nuclear deal was announced, there were calls to award the Nobel Peace Prize to US Secretary of State John Kerry (left) and Iranian Foreign Minister Mohammad Javad Zarif. The Vienna deal is a capitulation to one of the worst regimes on Earth. Far from requiring the Iranians to dismantle their illicit nuclear program, the accord leaves almost all of it intact. In exchange for little more than a promise to delay its development of nuclear warheads, Tehran is rewarded with $150 billion in sanctions relief and, within a few years, the lifting of the UN embargo on conventional weapons and missile sales. The Islamic Republic is the world's foremost state sponsor of terrorism, yet nothing in the agreement requires any change in its notorious behavior. And despite the regime's long record of treaty violations and deceit, the deal enables it to stall for almost a month before complying with a demand for access by inspectors — hardly the "anytime, anywhere, 24/7" inspections that the Obama administration had claimed it would insist on. The White House wanted to sign a deal; Iran's rulers wanted to ensure their path to the bomb and nuclear legitimacy. Both got what they wanted. The consequences will be a nuclear arms race in the Middle East, more Iranian terrorism and subversion, and a greater likelihood of war. A Nobel peace prize — for that? 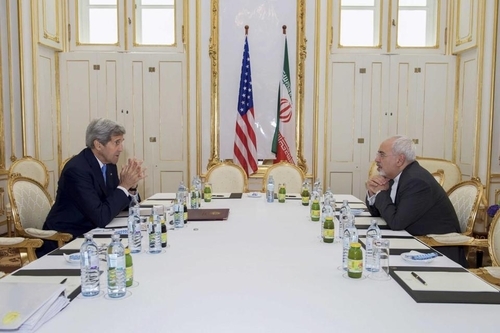 The Obama/Kerry willingness to concede anything for a nuclear deal with Iran has been likened to Neville Chamberlain's infamous Munich agreement with Adolf Hitler in 1938. Then too shameless capitulation was hailed as a triumph of peacemaking and diplomacy. Chamberlain was cheered as a hero in the press and on the street, and he won a resounding vote of confidence in Parliament. He was widely nominated for the Nobel peace prize, including by a dozen members of the Swedish parliament. Who knows — he might have received it, had Hitler waited just a little longer before invading Czechoslovakia. All too often the Nobel Committee has seen fit to bestow its prestigious honor on men who negotiated "peace" accords that ended up undermining peace. 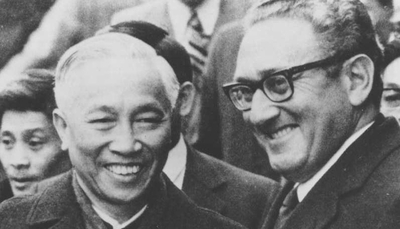 In 1973, the prize was awarded to Secretary of State Henry Kissinger and North Vietnam's Le Duc Tho, lead negotiators of the Paris Peace Accords that purported to end the Vietnam War. In reality the Accords paved the way for US withdrawal, effectively abandoning South Vietnam to defeat and brutal occupation by the communist North. US Secretary of State Henry Kissinger and Le Duc Tho of North Vietnam were awarded the Nobel Peace Prize for negotiating the Paris "peace" accords that effectively abandoned South Vietnam to defeat and occupation by the communist regime in Hanoi. The Locarno treaties of 1925, now largely forgotten, settled Germany's borders with Western Europe, and were extravagantly portrayed as guaranteeing that Germany would never again violate the peace. "France and Germany Ban War Forever," cheered The New York Times, and the Nobel Committee, intoxicated with the "spirit of Locarno," awarded peace prizes to the French, British, and German foreign ministers who negotiated the deal. Yet the treaties deliberately left Germany's eastern borders open to "revision." In essence, one Polish leader remarked bitterly, "Germany was officially asked to attack the east, in return for peace in the west." The promised peace was a mere bubble. The war Locarno facilitated would prove all too bloodily real. The Nobel Peace Prize for the Oslo Accords — presented in 1994 to Yasser Arafat, Yitzhak Rabin, and Shimon Peres — was another blunder that looks even worse in retrospect. A peace prize for Arafat, an arch-terrorist and hatemonger who devoted his life to the destruction of peace? It was as contemptible a choice as the Nobel Committee has ever made. Of course, there's always next year.